ETHEREAL ENFOLD proposes a new type of Sukkah as a temporary pavilion in Toronto, Canada. The proposal maintains the spatial symbolisms and the ethereal environment of the traditional structure while it is embedded with a contemporary design elegance and structural efficiency. Thus the design is based on the traditional Sukkah parameters and aesthetics. A traditional Sukkah is a temporary hut constructed for use during the week-long Jewish festival of Sukkot. The concept of the ETHEREAL ENFOLD is based on the Star / Shield of David, which is re-arranged to reflect the hyperbolic paraboloid surfaces (Hypar). The hyperbolic paraboloid proposal responds to the fact that a temporary pavilion should be financially and structurally efficient, thus it could benefit from hypar's very nature, achieving its complex geometries out of straight segments. 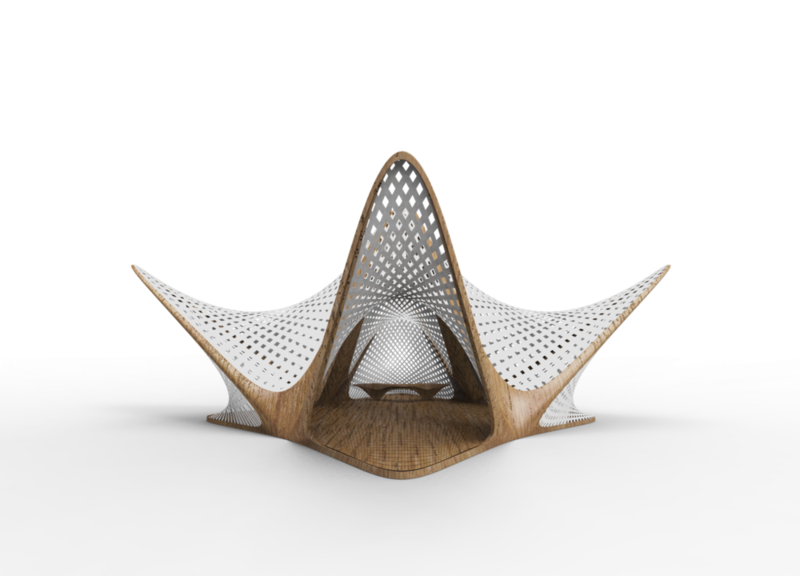 Thus ETHEREAL ENFOLD is consisted from 4 Hypar surfaces, which create 4 petals with 4 touching-down points based on the timber skeleton and reinforced carbon fabric polymeric composite stripes, which are deployed in between the skeleton creating a weaved effect providing different densities and openings which filter the light for the interior. Thus using reinforced carbon fabric stripes, which show mechanical properties similar or higher than the conventional metallic materials with higher strength-to-weight and stiffness-to-weight ratios while they present higher fatigue strength and higher corrosion resistance, the structure consists a self-supported one while it is easily assembled and light to transfer. Simultaneously, through the play of densities and hierarchies between the stripes we can control the amount of light and shade inside the enclosed area creating an atmospheric enfold referring to the traditional Sukkah principles.